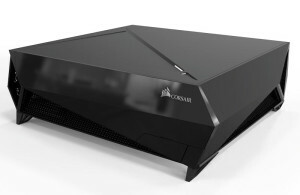 PAX PRIME 2015 — Seattle, Washington — August 28, 2015 — Last June Corsair unveiled a prototype of Bulldog, a powerful gaming platform that packs the sheer performance of a full-size desktop gaming PC into a gorgeous new all-black, whisper-quiet console chassis designed for the living room. Today at PAX Prime, Corsair is revealing the refined Bulldog production version that will ship in the 2015 holiday season. Bulldog DIY kit harnesses exclusive small form factor Corsair components and cooling technology that form the core of a 4K ready gaming PC—a sleek, highly-vented console-sized chassis, an ultra-efficient SFX power supply, and twin compact liquid CPU and GPU coolers – all integrated with a mini-ITX motherboard. Simply add a 6th generation Intel® Core™ processor, memory, graphics card, storage and Windows or SteamOS for an incredible living room experience unmatched by any console or set top box. Corsair’s proprietary liquid cooling technology makes it possible to overclock both the CPU and graphics card, allowing Bulldog to render silky smooth 4K graphics faster and quieter than conventional PCs. An included Corsair Hydro Series H5 SF liquid cooling block and radiator cools the CPU. Liquid cooled GeForce® GTX 980 Ti graphics cards, developed by Corsair and MSI, will be available separately from Corsair.com in the US. In addition, Corsair will sell a liquid cooling kit for graphics cards, comprised of an HG10 cooling bracket and Hydro Series H55 liquid cooler, for users that want to upgrade their existing graphics card. The initial release of Bulldog is designed with PC do-it-yourselfers in mind, with a builder-friendly layout and tool-free features, and uses standard mini-ITX motherboards and SFX12V PSUs for future-proof upgradeability enabling users to keep pace as games and hardware evolve. The Bulldog DIY kit includes the chassis, power supply, CPU cooler, and motherboard, will be available at year-end at a suggested price of $399 USD. Corsair has refined and fine-tuned Bulldog since the unveiling of the prototype in June. The chassis, now all black, sports an elegant high-gloss face that compliments any room, and is built from steel and polymer with stronger, compact legs for a cleaner look and increased stability. The ventilation and component are further optimized to improve airflow for even cooler, quieter operation. Hydro Series H5SF small form factor liquid CPU cooler – Quietly cools the fastest CPUs while exhausting heat from the chassis. Bulldog will be available at the end of 2015. To get the latest new on Bulldog and availability visit: www.corsair.com/bulldog. Corsair will showcase the new Bulldog at PAX Prime in Seattle from August 28-31 in booth #3342. Copyright © 2015 Corsair Components, Inc. All rights reserved. Corsair and the sails logo are registered trademarks of Corsair in the United States and/or other countries. NVIDIA and GeForce are trademarks and/or registered trademarks of NVIDIA Corporation in the U.S. and other countries. All other company and/or product names may be trade names, trademarks, and/or registered trademarks of the respective owners with which they are associated. Features, pricing, availability, and specifications are subject to change without notice.